What if you don’t have mobile data but you still want to use Uber? You just need to have an internet connection (via WiFi or other network connections possible) while requesting for the ride. Once you’ve booked your ride and the Uber is arriving, you can disconnect from the connection and wait for the ride at the pick-up point you selected. NOTE: Before you disconnect from the network, take note of the driver’s name, plate number and the model/make of the car. You can screenshot the screen so you can access these information from your picture gallery. Also, take note of the estimated arrival time and be sure you’re at the pick-up point when the car arrives. 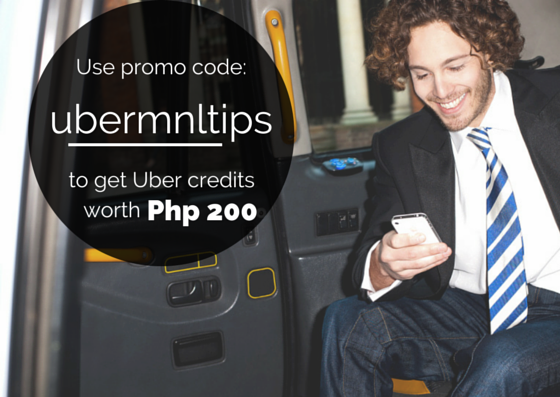 Use our invite code “ubermnltips” to get 200 Uber credits. Happy Riding! Is it possible to order an Uber via PC (using a browser)? As of now, only using the mobile app. Hello, I lived in the USA and I have a USA credit card. I will be visiting Manila in June and I will probably be using Uber. My question is, can I use my USA credit card? I tried to pay for and plan and uber for a friend in another town. I included both addresses and it said I wasn’t in the area. But it was for the other town. Can’t I order for a friend in different town? My sister is looking to schedule a ride tomorrow using uber however she does not have internet access. How can she schedule this? You can have someone else request for her at the time she needs it. after arrival to the destination, do i need network connection like wifi or data access to pay for the trip or just my debit card ? No need. It will automatically charge. Hi, you must have your internet to request a ride. I am scheduling this for the first time. I will have internet access at home to schedule a ride for later in the day or night. I won’t have mobile internet. I will use a debt card to pay. Is that ok? Hi Danielle, Uber is an on-demand service. You can’t request for a future booking. I am going to visit a few cities out of my country where I wont have internet connection, how can I order uber in this situation. I would like to be able to use Uber, however, refuse to get a smart phone. Why do I need to pay a provider $50 monthly to have it when I can use my dumb phone pre paid when I want to. I feel that I should be able to call Uber for a ride, and not be forced to have a smart phone to use the service. Yes, I have a home computer, do not have a debit or credit card, isn’t this discrimination against those of us that are not internet/ smart phone junkies and do not want our information, phone numbers, banking info etc floating around in cyberspace voluntarily? After uber drop off, I find myself without wifi access (no “hot spots”)my iPhone… How can I contact Uber for return trip? If you had an issue with your trip (about fares, payment, lost and found, driver behavior, etc), you can report your concern via the Uber Rider App [Go to Menu > History> Select Trip > Select Need Help > Select specific issue] Or you can also login to help.ubrer.com.